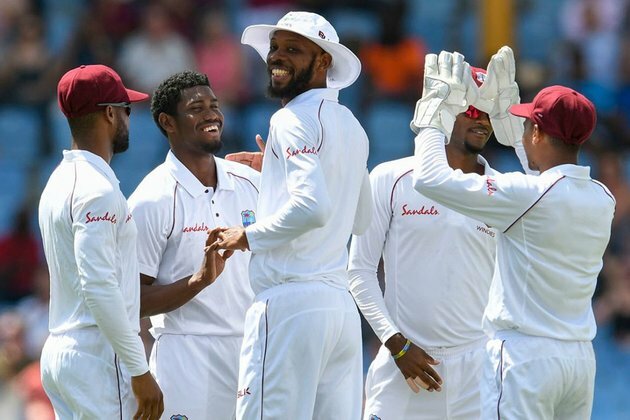 West Indies allrounder Keemo Paul has claimed the wicket of under-pressure opener Keaton Jennings to send England to lunch at 46-1 on the first day of the third and final Test in St Lucia. With West Indies already holding an unassailable 2-0 lead in the series, Rory Burns went to the break having negotiated a tricky session to be not out 27, while Joe Denly was unbeaten on 4, having survived a late scare. Jennings returned to the top of the England batting order after being axed for the second Test, with Denly - a debutant in Antigua - moving down to No.3. West Indies won the toss and sent England in to bat but, after a sedate opening by both sides in which the only real excitement came as Kemar Roach tempted a thick edge off Jennings which dropped just short of John Campbell in the slips, rain stopped play for half an hour. After the resumption, Roach and Jennings were the protagonists again as the match threatened to spring to life on a pitch offering far less spice than in Antigua. Roach made a hearty appeal for lbw with Jennings on just three but, presumably having heard two noises, the rest of the West Indies side were not as enthused. Replays suggested that the ball hit the front and back pads, however, and not the bat, and would have gone on to clip leg stump. Jennings had exhausted his chances by the time Paul - replacing suspended captain Jason Holder in the West Indies team - came into the attack immediately after drinks. With his first delivery in just his third Test, the 20-year-old Paul had Jennings out to a tame catch by Darren Bravo at first slip, the batsman having scored just eight runs in a less-than-convincing innings to put England at 30-1. Denly overcame a tense moment amid a big appeal for caught behind off the bowling of Shannon Gabriel in the last over before lunch. When the batsman was adjudged not out, West Indies called a review, which revealed that while the ball had struck Denly on the glove, he had taken his hand off the bat and was therefore not out. Ben Stokes, who was in doubt with a bruised heel, passed a final fitness test to be included in the England team, and fast bowler Mark Wood was called up, meaning Sam Curran was dropped.